What does it take to achieve Bible fluency? 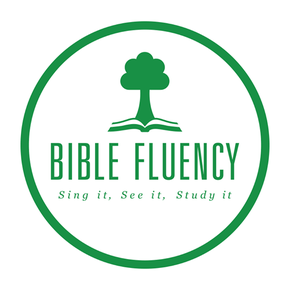 In my next two posts I will guide you through how to use a brand new free resource called Bible Fluency: Sing it, See it, Study it, found at biblefluency.com. This first post seeks to answer the question: How can I use music, visuals, and a workbook to help me learn to think my way through the Bible? Bible Fluency employs music, visuals, and worksheets to help you learn your way around the Bible. The 400 most important events, characters, and themes are embedded in seven songs that have been recorded by singers from Redemption Hill Church. (The song titles are: Pentateuch, History, Poetry & Wisdom, Prophets, Gospels, Acts & Letters of Paul, General Letters & Revelation). High quality color learning icon flashcards correspond to the same 400 ideas that are highlighted in the songs. These 400 ideas are linked to particular books of the Bible. A workbook guides you through questions from the Bible itself to help you connect the songs and flashcards with what is actually found in the Bible. A person who has followed this course of study will immediately be able to recall that the story of Joseph is in Genesis, the walls of Jerusalem are rebuilt in Nehemiah, a locust plague is the backdrop for the book of Joel, the parable of the Good Samaritan is found in Luke (not Matthew, Mark, and John), Paul’s thorn-in-the-flesh is described in 2 Corinthians, and “do not love the world or the things that are in the world” is a verse from the letter known as 1 John. Now you’re on your way to becoming “Bible Fluent.” This isn’t "Bible Basics," at one end of the spectrum, nor is it "Bible Mastery" at the other; it is a fluent recognition of what-is-where and where-it-is-going in the Bible. Wouldn’t you love to become “Bible Fluent”—really and truly? Then visit biblefluency.com and start learning. And please share this great resource with anyone you think might want to know about it. My next post will be called “Teaching Bible Fluency: Using Classes and Videos."